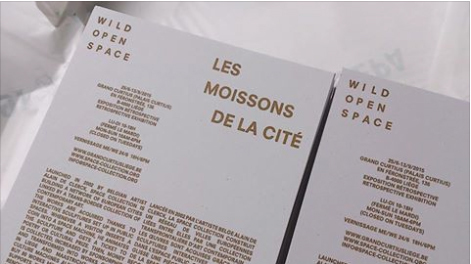 Eleni Kamma participates in a retrospective exhibition by SPACE Collection titled Wild Open Space / Les Moissons de la Cité. The exhibition runs until the 20th of September. Launched in 2002 by Belgian artist Alain de Clerck, SPACE Collection is building a network of European cities, linked by a trans-border collection of contemporary art. Carlos Aires, Gentiane Angeli, Charlotte Beaudry, Vincen Beeckman, Michel Beine, Nina Berman, Anne-Sophie Bomal, Nicolas Bomal, Olivier Bovy, Raphaël Carette, Thomas Chable, Jacques Charlier, Alexandre Christiaens, Nicolas Clément, Jerome Daly, Michael Dans, Jonathan De Winter, Eric Débris, Alain Declercq, Serge Delaunay,Vincent Delbrouck, Messieurs Delmotte, Isabelle Detournay, Paul Devens, Philippe Durand, Michel François, Pierre Gerard, Myriam Hornard, Pierre Houcmant, Laurent Impeduglia, Eleni Kamma, Babis Kandilaptis, Nicolas Kozakis, Charlotte Lagro, Jules Lallement, Sophie Langohr, Bruno Le Boulengé, Aurélie Levaux, The Little Artists, Jacques Lizène , Emilio Lopez-Menchero, Sylvie Macias-Diaz, Karine Marenne , Xavier Mary, Ccil Michel, Michaël Nicolaï,Olivier Pe, Marc Petit, Pica Pica, Pol Pierart, Frédéric Platéus, Marie Rosen, André Stas, Chaim van Luit, Bernard Walhin, Marc Wendelski and Marie Zolamian.